Sunless tanning is a fantastic alternative for anyone to have a realistic, natural looking tan, without being exposed to the sun. It's perfect for those who have issues with UV exposure, or it can be used in combination with UV tanning, for accelerated results. 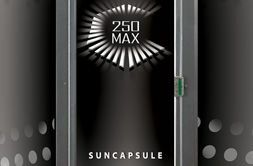 It's suitable for all skin types and recommended by dermatologists as a safe way to achieve a tan. Arriving anywhere, beautifully tanned, gives you the benefit of added confidence, especially on those occasions when you need to reveal more skin. Sunless tans are possible because of an ingredient called DHA (dihydroxyacetone), a derivative of sugar cane. Sunless tanning products and solutions are formulated to work with the body's chemistry to darken the top layer of skin, and then fade gradually, as our skin cells shed, naturally. DHA oxidizes with proteins in the skin, much the same way that a peeled apple turns brown when exposed to air. DHA is approved for medical, and topical cosmetic use by the FDA and the solutions are safe and non-toxic. The effect develops only in the top layer of the skin during a 4-8 hour processing time, and can last an average of 5-7 days. Sunless tanning was discovered by accident almost 40 years ago when a researcher named Eva Wittgenstein, was studying the effects of dihydroxyacetone (DHA), on children who had glycogen storage disease. The children spit up some of the liquid concentrate and it splashed on their skin. A few hours later, brown spots appeared where the splashes had been wiped away, and then gradually faded in 5-7 days. One of the first cosmetic uses of DHA to produce a tan was a product called QT back in the 1960's. 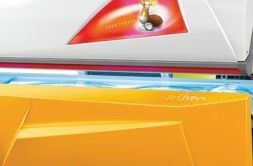 Problems in the early days of sunless tanning products, like orange colour tones and streaking, were mainly due to varying concentrations of less pure forms of DHA, as well has incorrect levels of dyes and iron oxide. Another common complaint about earlier self tanning products was the offensive scent. This was due to the breakdown of inferior ingredients. Improved ingredients and years of research have since lengthened the shelf life of today's products, and natural fragrances have made them much more appealing. A few years ago formulations, and the way in which they were delivered, changed dramatically. The products and solutions we use at Kix Tanning contain more measured concentrations of higher quality DHA, and the addition of erythrulose, to help produce a more realistic tan. Erythrulose is a naturally occurring keto-sugar which is found in various fruits and roots and when added to formulations, the tans appear browner. Our sunless solutions also contain moisturizing Aloe Vera and vitamins A, E and C.
We also carry a full range of quality sunless – self tanning products for at home use. 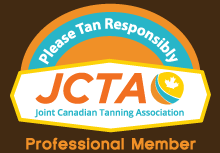 When you decide which method is best suited for you, call the professionals at Kix Tanning 604-737-1101 to schedule an appointment. A sunless tan gives you no protection from the sun, like a UV tan. Use sunscreen, like you would normally, without a tan. Your sunless tan takes 6-8 hours to process completely. Closer to the end of your processing time, you will appear darker and perhaps a little too dark for your liking. Don't panic, your final result will be more natural once you shower off the topical bronzer. Normal washing will remove the colour of the topical bronzer from most bed linens, and washable clothing. To avoid any possibility of staining, during the processing time, avoid wearing fabrics made of wool, nylon, or silk, or sitting on light coloured leather with bare skin. It is normal, during your first shower, to see the topical bronzer washing off. What is left behind will be a natural looking tan. Simplified, it's as easy as shower and scrub your skin, then wait 6-8 hours after a sunless treatment before you get wet or moisturize again, but the following are more detailed instructions to help you get the most for your money, and the best results. 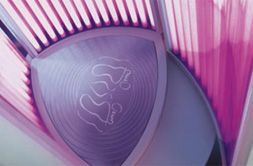 Shave, and have any waxing done at least one day prior to your sunless session. Having clean, exfoliated skin is an important step before any sunless treatment, to smooth, and even out your skin's texture. Exfoliation is the process of sloughing off dead cells and flakes from the top layer of your skin in the bath or shower with a loufa, shower puff, or exfoliating gloves. For optimum sunless results, shower or bath using an oil-free exfoliating scrub with a rough face cloth, or puff, and rub in circular motions, paying particular attention to rough areas like, elbows, knees, and heels. Do not use salt/oil or sugar/oil based exfoliates, unless you shower again before tanning to remove the film they leave behind on your skin A great product choice, and our favourite at Kix is, Sunless Primer by California Tan, because it is specially formulated for sunless applications. You can apply a water-based moisturizer after exfoliating, providing it's at least two hours prior to your appointment, especially if you're experiencing dry skin. If you don't have acrylic or gel nails, apply a coat of nail polish or use the supplied barrier cream on bare nail beds, to protect from possible discolouration. Remove any deodorant, perfumes, foundation, oil based moisturizers, and jewellery before your session. You can wear eye liner and mascara, also lip coverage is recommended. Wear loose dark clothing after your session, and until your tan is set. Flip flops on the feet are a good choice. Don't wear tight socks or tight boots right after getting a full body tan, as it could cause a tan line where they rub. Wait at least 6-8 hours after your session before you shower, moisturize, swim, exercise or get any esthetic services done i.e. pedicures, manicures or hair. After your first shower, moisturize your skin daily with a water-based moisturizer, and re-apply after swimming, exercising, or any prolonged exposure to water. 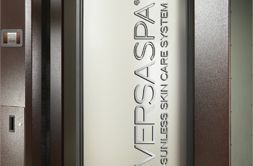 Or used daily without a base tan, as you would a moisturizer, to gradually build up a tanned appearance. Our favourites are Tan Extender by California Tan, or Hempz Shimmer Bronze Herbal Moisturizer with DHA. Moisturizing is always important to help maintain a sunless tan, but more so if you have dry skin, flaky patches, or for anyone during periods of especially hot or cold dry weather. Also, because an aircraft's air has very little humidity, and passengers are not allowed any liquids onboard a plane, we recommend moisturizing before your flight to prevent your skin from feeling dry in mid air. After a sunless treatment avoid scrubbing your skin with anything rough like a loufa, and don't use any exfoliating facial or body scrubs until your ready to prepare for your next sunless treatment, to preserve your tan. Frequent use of hot tubs or chlorinated swimming pools will diminish your tan sooner.